On 2 May 2016, a broad range of 59 human rights and civil society organizations condemned the politically-motivated charging of six human rights defenders from a Cambodian human rights group, the country’s National Election Committee (NEC) and the United Nation’s Office of the High Commissioner for Human Rights (UNOHCHR). The targeting of these individuals, five of whom were sent to pre-trial detention today, is the latest escalation in a far-reaching government assault on civil society ahead of upcoming local and national elections, and is a clear reprisal for support provided by rights workers in a politically-sensitive case. Four senior staff of the Cambodian Human Rights and Development Association (ADHOC) – Ny Sokha, Nay Vanda, Yi Soksan and Lim Mony – were today charged with bribery of a witness under Criminal Code Article 548 and sent to CC1 and CC2 prisons in Phnom Penh. In addition, former ADHOC staffer Ny Chakrya, recently appointed deputy secretary-general of the NEC, and UNOHCHR staffer Soen Sally were charged as accomplices to bribery of a witness (Criminal Code Articles 29 & 548). Ny Chakrya was sent to Police Judiciare (PJ) prison. If convicted, all six could be sentenced to between five and ten years’ imprisonment. 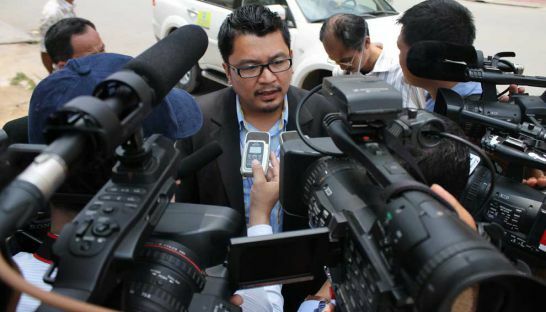 The six human rights defenders were summoned by the Anti-Corruption Unit (ACU) for questioning last week and all but the UNOHCHR staffer subject to at least four days of interrogation – firstly by the ACU and then by the prosecutor – in relation to a complaint signed by Khom Chandaraty, also known as Srey Mom. The complaint was lodged following her questioning by anti-terrorism police and a prosecutor about an alleged affair with deputy opposition leader Khem Sokha, after ADHOC responded to Srey Mom’s request for legal and material assistance. In the context of such support, ADHOC provided Srey Mom with $204 to cover food and transport costs, including to attend questioning by judicial authorities. This legitimate expenditure of a small sum of money to cover basic expenses of a client is now grotesquely being portrayed by the ACU as bribery and corruption. The targeting of UNOHCHR staffer Soen Sally by the ACU and the court has disregarded his diplomatic immunity as an employee of the United Nations. The ACU, and later the Prime Minister himself, both argued that Soen Sally does not enjoy such protection. The case is a farcical use of both the criminal justice system and state institutions as tools to intimidate, criminalise and punish the legitimate activities of human rights defenders and civil society. The ACU was created to tackle the endemic corruption prevalent in Cambodia, not to operate as a vehicle for government repression of civil society. The involvement of Ministry of Interior Central Security officers alongside ACU personnel dealing with the case clearly demonstrates the securitization of civil society activities. Under international human rights law, including treaties that Cambodia has ratified, Cambodia is legally bound to respect and protect the human rights of all people under its jurisdiction, including the rights to freedom from arbitrary deprivation of liberty, and freedom of expression, association and peaceful assembly. Civil society reiterates its strong condemnation of the charges, demands the release on bail of the five and reaffirms the rights and fundamental freedoms of peaceful human rights defenders to conduct their activities free from threats and punishment. We further call for the judicial investigation to be conducted impartially and call for an end to executive interference in the judiciary.